Categories:?This is where you define categories of sounds. The format is X=abcde where X is the category (any single character) and abcde is a run of characters that are assigned to the category. Categories are used in the syllable boxes. When a category is chosen, a character is chosen from its run according to a utilization rate that favors the characters at the beginning of the run. The rate can be changed via the Dropoff selector. Rewrite rules:?These are used to perform global replacements on generated words. Since categories only output one character at a time, you can use this for two-letter phonemes. For instance, you might use T||th to change the generated word Tem into them. Predefs use rewrite rules to remove long runs of letters, modify letters based on the letters around them, and more. SWord-initial syllables:?If the generator asks for a multi-syllable word, syllables in this box will be used for the first syllable in the word. of syllables. ?If unchecked, more options will appear, and the generator will take them into account when generating words. Leave this checked if your syllables don&apos;t have special rules as to when they appear in different parts of a word. Single-word syllables:?If the generator asks for a single-syllable word (a monosyllable), it will pull a syllable from those in this box. See Word-Initial Syllables for more information. Mid-word syllables:?If the generator asks for a multi-syllable word, the syllables in this box will be used to form syllables that are neither the first nor last in the word. See Word-Initial Syllables for more information. Word-final syllables:?If the generator asks for a multi-syllable word, syllables in this box will be used for the final syllable in the word. See Word-Initial Syllables for more information. Output type:?This choice determines what will appear in the Output section below. Text output will output a pseudo-text. Wordlist outputs a columnized list of 150 words. Giant wordlist gives you 750 words, presented one per line. All possible syllables presents all possible syllables, one per line, ignoring Dropoff and Monosyllables settings. Dropoff:?This choice determines how fast the utilization rate declines. (See Categories.) Assume you&apos;re using S=tspkThfS. Fast makes the t appear much more than s, which appears much more than p, and so on. Molasses has a less steep decline, but t still shows up more than s, and so on. Equiprobable gives all choices an equal chance. Monosyllables:?This choice determines how often single-syllable words are generated, from Rare producing very few, to Always giving nothing but. NOTE: This renders all rewrite rules useless across syllable boundaries. 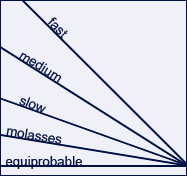 Slow syllable dropoff ?Normally, syllables at the top of a syllable box will be chosen more often than syllables lower down. If checked, this is still true, but upper syllables will not have as much of an edge over lower syllables. ?Clicking Save to Browser will store the current input to your browser&apos;s localStorage, if your browser supports it, and create a new Custom Settings Default. If you already have info stored, this will overwrite it! ?Clicking Export Settings will open a box and fill it with formatted information based on the settings currently active. Copy and save it for your own records, and use Import Settings to reload it at a later date. em ?When using a Wordlist as an Output type, this determines how much space each word will take up. Modify this if the words you're generating are larger (or much smaller) than the space the Wordlist is giving you. words ?When you use a Wordlist as an Output Type, it will output this many words. words ?When you use Giant Wordlist as an Output Type, it will output this many words. ?Clicking the Generate button starts the generator, printing output into the Output section below. The Output Type option determines what kind of information gets printed. ?Clicking the Erase Output button erases everything in the Output below. ?Clicking the Clear Input button erases everything in the syllable, category and rewrite boxes, unchecks all checkboxes, and sets dropoff, output type and monosyllables to their initial values. ?Clicking the Extra Characters button puts a bunch of IPA, Latin, Cyrillic, Armenian, Greek and Coptic characters into the Output section. (You can then cut and paste them into any of the boxes above!) Note: some characters may not print, especially if on a mobile device. Starter Large Inventory Latinate Simple Chinese Kartaran Reemish ?Choosing a selection from the drop-down list and then clicking the Load Predef button will load a set of pre-defined categories, rewrite rules and syllables for you to use. Other checkboxes and options may change, too. Kartaran and Reemish are fictional language families of my own construction. Other options should be self-explanatory.